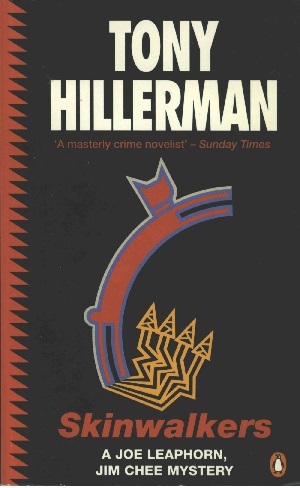 This is the British paperback edition of Tony Hillerman's Skinwalkers, published in 1993 by Penguin Books in London, England. Penguin Books is an imprint of PenguinGroupUK that publishes highly commercial good quality affordable paperback books. The cover was designed by Instinct and depicts a stylized animal leaping with four lightening bolts emerging from the ground at its feet. Binding: Full-colored paper covers with the author, title, a smaller version of the stylized leaping animal from the cover, the ISBN, and the publisher's logo printed vertically on the spine.